The city emergency brake function is part of the area monitoring system (Front Assist) and is active when Front Assist is switched on. Depending on the equipment level, the city emergency brake function can be activated or deactivated using the button and the and Driver assistance function buttons in the infotainment system . The city emergency brake function gathers information on the traffic situation up to a distance of about 10 m in front of the vehicle within a speed range of about 5 km/h (3 mph) to 30 km/h (19 mph). 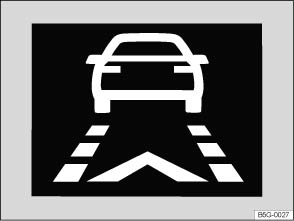 The system prepares the vehicle for emergency braking if it detects a possible collision with a vehicle ahead . If the driver does not react to a possible serious collision, the system can automatically stop the vehicle with brake pressure with increasing intensity so as to reduce the speed in a possible collision. Hence the system can help minimise the consequences of an accident. Automatic deceleration by the city emergency brake function will be shown by the advance warning display in the instrument cluster 1). The intelligent technology of the city emergency brake function cannot change the laws of physics. The driver is always responsible for braking in time. Adapt your speed and distance from the vehicles ahead to suit visibility, weather, road and traffic conditions. The city emergency brake function cannot prevent accidents and serious injuries by itself. The city emergency brake function can carry out unwanted brake interventions in certain complex driving situations, e.g. at building sites and metal tracks. The city emergency brake can issue unnecessary warnings and carry out unwanted braking interventions when its function is impaired, e.g. if the position of the radar sensor has been soiled or changed. While the vehicle is in motion, the city emergency brake function does not react to persons, animals and vehicles crossing or approaching in the same lane. The brake pedal feels harder when city emergency brake function triggers the brakes. Automatic brake intervention by the city emergency brake function can be stopped by using the clutch, the accelerator or steering intervention. The city emergency brake function can brake the vehicle to a standstill. The vehicle will not be held permanently by the braking system. Depress the brake. Switch off Front Assist and the city emergency brake function in the event of multiple unwanted interventions. Go to a qualified workshop. Volkswagen recommends using a Volkswagen dealership for this purpose. 1) Displayed in colour on an instrument cluster with colour display.